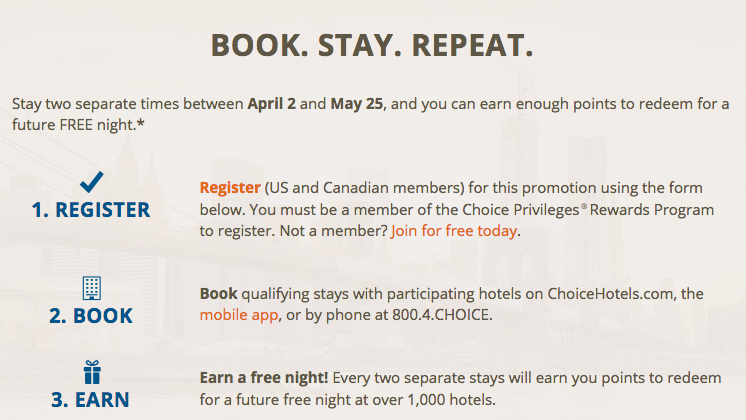 Choice Hotels has revealed the details of their spring promotion and as we usually see, it is the same offer they have each quarter. They word the promotions differently in terms of get a free night, get a $50 gift card etc. However the gist of the promos are the same, they will award you enough bonus points after you complete 2 separate stays to have 8,000 points after those stays. In this case it is being promoted as the Free Night offer since you'll have enough points after the two stays to redeem for a hotel stay at their participating 8,000 point level hotels.